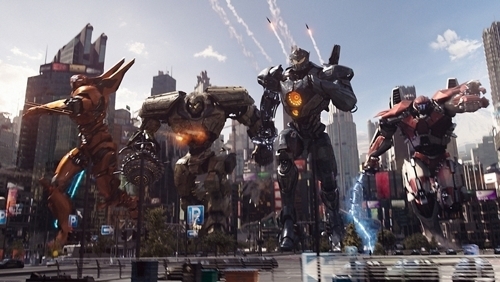 SEOUL, March 26 (Yonhap) -- The Hollywood action blockbuster "Pacific Rim Uprising" took the top spot in its first weekend at the South Korean box office, data showed Monday. The Universal's big-budget sci-fi sequel attracted 655,042 moviegoers from Friday to Sunday, taking down the previous lead, "Be With You," to No. 2, according to the computerized tally from the Korean Film Council. Directed by Steven S. DeKnight, "Pacific Rim Uprising" features giant robots fighting against alien monsters to save the world. It is a sequel to the 2013 hit "Pacific Rim." Even at No. 2, the Korean romantic movie, starring So Ji-sub and Son Ye-jin, remained strong, adding 576,981 ticket sales in its second weekend to its cumulative total of 1.82 million. The movie is a remake of the highly successful 2004 Japanese movie of the same name about a mother who returns to her family a year after her death. "The Vanished," starring Kim Sang-kyung and Kim Kang-woo, placed third with 92,630 views. Directed by Lee Chang-hee, the homegrown thriller is about a detective investigating the disappearance of a woman's corpse from a morgue and trying to uncover the cause of her death. "Little Forest," the Korean drama led by Kim Tae-ri, was fourth with 60,162 views. Coming in fifth was "GONJIAM: Haunted Asylum," which attracted 54,780 people to its two-day paid preview events over the weekend ahead of its official release on March 28. The domestic horror film tells the story of seven young people teaming up to experience an abandoned former psychiatric hospital near Seoul, which CNN called one of the freakiest places in the world.